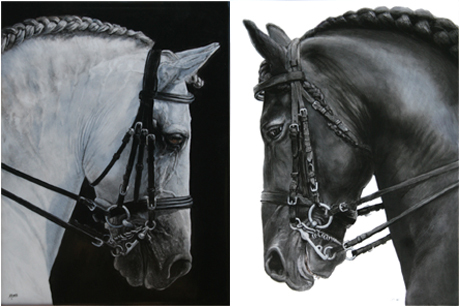 The rationale for the double bridle is a mystery to many equestrians, so let’s explore it. 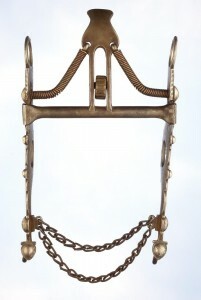 The double bridle, which is typically associated with what we call “English” style riding in the US, employs two kinds of bits, a snaffle (or a “bridoon”) and a curb. It is also often called a “full bridle” – which is a bit of a misnomer, as it implies a bridle would somehow be incomplete without a snaffle and a curb, which is untrue. 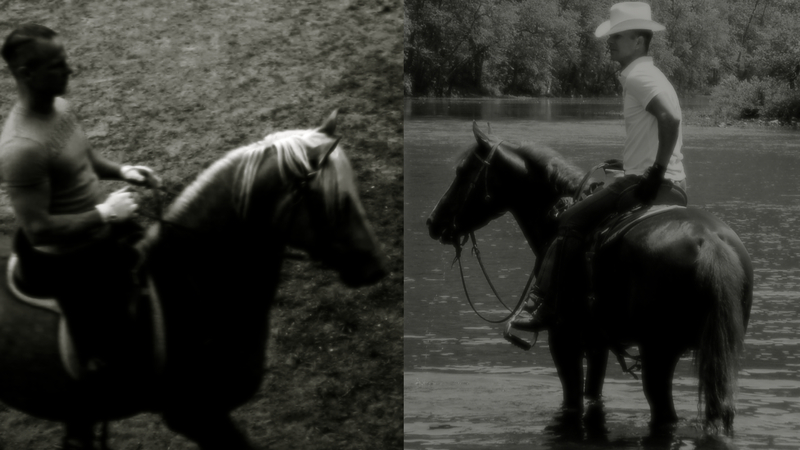 In fact, certainly in a classical and historic sense, the finished dressage or manege horse’s training remains “in progress” – that is, they are not yet “finished” – as long as the double bridle is being used – in the same way the Californio Vaquero-styled bridle horse is still in training as long as he is in the “two-rein” rig (hackamore + bridle animated by the spade bit comprised of a curb bit with a “spoon”). When the bosal is no longer needed, and the bridle horse is ‘finished’, he operates readily with only one hand on the curb – and, historically, the same was true for high school dressage horses. In the US, even experienced equestrians often naturally associate one-handed riding on the curb with what we call “Western”-style equitation. But in the classical Romanic tradition (a.k.a. Baucherism, legerate, French classical, “artistic dressage,” tauromacia, etc. ), and even the classical Prussian-style typically exhibited in FEI-approved competition dressage, the finished manege horse should be ridable only on the curb with the bridle hand. The reason both schools of horsemanship share this concept is that their roots converge – both emerge from high school manege, the horsemanship revealed by the Duke of Newcastle, William Cavendish in his two treatises. Thus his concept of the cavesson, which we will cover in more detail later. This is to say, 12 ounces of pressure from the rider’s hand equates to 12 ounces of pressure on the horse’s mouth. In simplest terms (and in the context of preliminary training), pulling left points the horse’s nose in the same direction, and tends to veer him left; pulling right veers him right, and so on. Simple enough. Conceptually – for the young horse and the novice rider – the early “language” of the snaffle is quite easy to understand and common-sensical: follow your nose. 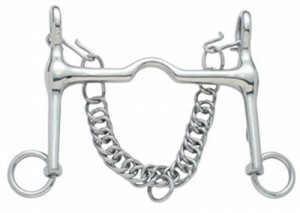 The use of the snaffle will become much more sophisticated, of course, as we advance the horse’s training, but in the hands of a novice rider, this bit (compared to other bitting options) will tend to do the least unintended physical and psychological damage to the horse, and be least detrimental to his present and future training. Since the bit is jointed in the middle, its action is gentler than would be a solid solid bar, and therefore less punitive to the young horse who will be restive and unsteady with his head and neck as he begins to learn what is being asked of him. As an aside, the function of the the hackamore in the Californio training progression is more or less identical to that of the snaffle, and for initial training, in many ways, superior. Technically, we could call the hackamore a “leverage device,” because there is some leverage resulting from the mechanics of the bosal and mecate, however the action occurs on the horse’s nose, not in his mouth, preventing early unintended consequences which would later have to be undone. Like the snaffle, the bosal is conceptually very easy for both the novice horse and novice rider to understand, with the “direct pull,” follow-your-nose principle. Moreover, I find new riders are prone to more quickly find and develop their sense of tact and feel in their hands with the hackamore than with the snaffle. By and large, it is simply a more forgiving means of communication for everyone involved, and the traditional progression and application of the hackamore requires new riders understand essential principles of control early on (e.g., one rein stops, the notion of signal, the effect of timely release, etc. ), which will be sound, safe, correct, and ultimately applicable to any style of equitation they may pursue. All of this said, as one wanders into haute ecole / high school territory, there will be some very good reasons to pick up the snaffle for the next progression, but let me leave that for now. The curb bit is a “leverage” bit and, historically, the term “bit” refers to the curb bit specifically. Let me pause here to scare the unenlightened away from the curb. All leverage bits are intended for advanced horses in the hands of advanced horsemen who understand how they are used. Misusing a leverage bit on a horse is thoughtless abuse, plain and simple. Whether due to a lack of knowledge or a lack of regard, either bit can cause serious and potentially fatal injuries to the animal. A curb bit can easily generate enough pressure to break the animal’s jaw bone. Add the spoon of the spade-type curb, and it can gore his mouth to shreds. Either extreme, aside from the psychological damage which will never be undone, would render him unable to eat. Until you have been educated beyond doubt, you will lack the feel, technique, tact, and patience required to do anything other than antagonize and potentially damage your horse with the curb. This is not the place for novices to “experiment.” Ok, end of speech. more amplification of the original signal. The lack of a joint in the center of a proper curb means the mouth piece is solid and therefore movements of the hand are transmitted more cleanly, accurately, and distinctly. The purpose of the amplified signal resulting from leverage of the curb is not to cause increased pain to the horse. Nor is it ever intended to be used in a punitive fashion, nor as a means for unskilled riders to control unruly horses. Any such application is a blatant misapplication of the curb, indicating a lack of tact and education on the part of the rider. Fidelity: Amplification of the signal allows for higher fidelity in the communication between the rider and the horse, such that indications (aids, signals) of the hand may now be reduced to a whisper and virtually invisible to observers. On contact no heavier than the weight of a rein, the horse can more easily sense the most subtle movements of the hand. Balance: At the level of high school, while still using a double bridle comprised of the snaffle and the curb, and in conjunction with corresponding leg aids, the action of the snaffle may be used to encourage the horse to lift his neck, while the action of the curb encourages him to bring his nose towards his body. Utilizing these two axes, an expert is able to encourage the horse to properly balance himself in a manner most conducive to the next movement. Straightness: Presuming he has been properly educated on neck- and indirect-rein aids (which of course he should before being brought into the curb), in my experience, use of the curb has the effect of straightening the horse in his forward movement, while also encouraging the proper use of his shoulders for straighter, more balanced turns. Front-end Stability: In the curb (properly applied), younger horses in particular tend to stabilize their head and neck placement on their own, reducing impatient or nervous head-tossing, sneezing, and occasional “plunging” resulting from youthful exuberance and occasional impatience. If you do have a lot of persistent head-tossing, either you are being too heavy with your hands, or the horse is being pinched somewhere between the curb chain/strap, bit, or snaffle (so double check your fit); or the horse is finding a release when he noses out. The “spade” bit associated with the bridle horse training methods of the Californios is also a leverage device, and though the action of the spade bit is slightly different (acting additionally on the roof of the horse’s mouth via the “spoon,” which both adds weight – increasing fidelity, ultimately – and physically prevents the horse from getting his tongue over the bit), its function and place in the training progression is identical to the traditional or academic curb bit.